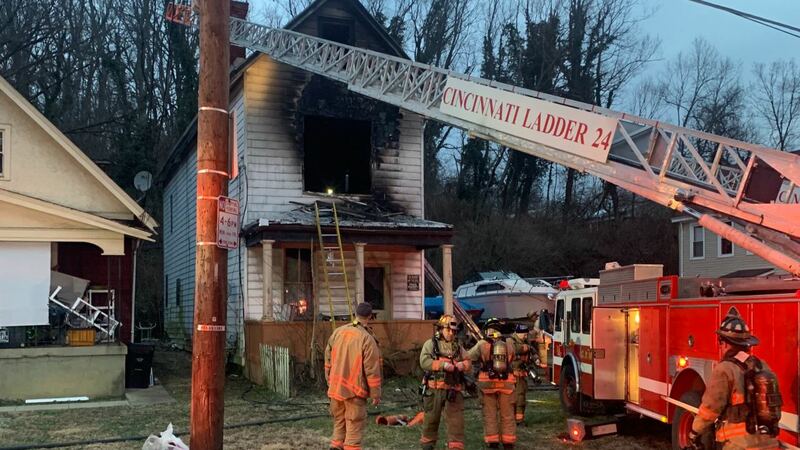 A firefighter was rescued after falling through the floor of a burning home in East Price Hill Wednesday morning, according to the Cincinnati Fire Department. The fire broke out at 2914 Glenway Avenue at about 6:30 a.m. Glenway Avenue is closed near Grand Avenue. Firefighters issued a mayday call when part of the first floor collapsed into the basement, officials said. Medics evaluated the firefighter, and they did not transport him to the hospital. Two dogs were inside the home at the time of the fire, but no one else was inside. One of the dogs died in the fire. About 86 firefighters responded, and crews had the fire under control at about 7 a.m., Chief Potter said. Crews stayed on scene to treat hot spots. Officials said the building will be torn down Wednesday due to the extent of fire damage and the previous condition of the building. The fire caused about $20,000 in damage, officials estimated. Glenway Avenue was closed Wednesday morning while crews were on scene. The cause of the fire is under investigation.